Between 26 May and 16 September, members of the public can experience a new IRENA-commissioned exhibit at the Venice Biennale of Architecture that conveys the primal beauty of renewable energy. Primal Sonic Visions is a powerful new series of multimedia works by internationally-renowned conceptual artist Bill Fontana which interweave art and renewable energy to create a compelling vision of a sustainable energy future. The exhibition is being held at the Università Ca’ Foscari Venezia, one of Venice’s most prestigious and historic universities, and a leading centre on sustainability. Adnan Amin, the Director-General of IRENA, Her Excellency Noura Al Kaabi, Minister of Culture and Knowledge Development of the United Arab Emirates, Olafur Grimsson, the former president of Iceland, and Bill Fontana presented remarks at the opening ceremony. The exhibit conveys the transformative power of renewable energies to a larger public audience, at a critical time when the imperative of tackling climate change has never been greater and when sustainability has become a central concern in our societies. Primal Sonic Visions features Bill Fontana’s remarkable sound and image installations, captured from renewable energy sites and sources in Austria, United States, Iceland, Italy, Portugal, the United Arab Emirates, and the United Kingdom. Although the global energy transformation is underway and accelerating, it is not happening fast enough. In order to meet the objectives of the Paris Climate Agreement to limit global temperature rise to two degrees, the pace of global renewable energy adoption must be increased by a factor of six. This requires concerted efforts by all to push for more ambitious actions, and art can be a powerful medium to help bring the needed change to achieve this. The exhibit is being presented at the Venice Biennale of Architecture, one of the world’s most prestigious cultural events. The Biennale attracts the world’s leading figures in the world of architecture, art, design, sustainability, and culture. The theme for the 2018 Biennale, Freespace, is particularly relevant as it emphasises natural and man-made resources, and underscores humanity at the core of architecture. 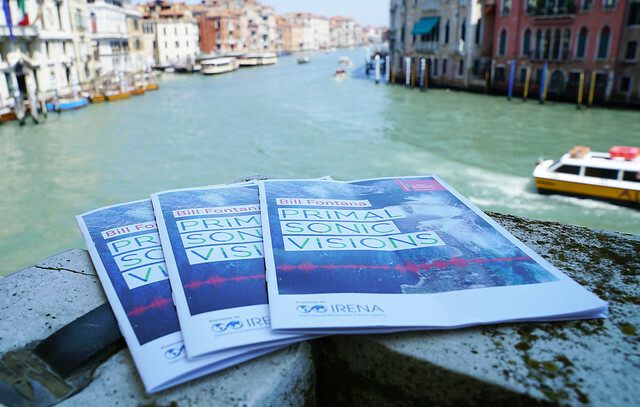 More than 60 countries are participating in this year’s Biennale, and Primal Sonic Visions is one of thirteen collateral events selected to take place during the Biennale as part of its programme. Between now and 16 September, thousands of people from all over the world will have the opportunity to experience Primal Sonic Visions. The exhibit was made possible thanks to the generous support of the Ministry of Climate Change and Environment of the United Arab Emirates and the Italian Ministry of the Environment, Land and Sea. Venice Science Gallery and Arthemisia collaborated in the organization of the exhibition. Primal Sonic Visions is a powerful series of multimedia works by internationally-renowned conceptual artist Bill Fontana which interweave art and renewable energy to create a compelling vision of a sustainable energy future.